What’s smaller than the point of a pin, likes something sweet to eat and a nice warm bath to lie in? It’s yeast – Frisky yeast, the force in dough that makes it grow! 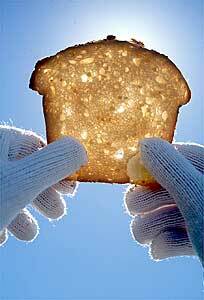 Every place where the light shines through is the very same place where frisky yeast grew. Yeast is the magic in bread. It’s is a living organism – a single celled spore or "seed" of a fungus that is in the air all around us and makes bread rise through a process called fermentation. Most bread bakers use a strain of yeast which scientists call Saccharomyces cerevisiae. It is packaged in small foil packets, and you can buy it at any supermarket as "active dry baker’s yeast". The packet has about a tablespoon of tiny beads, and each bead holds millions of spores of "sleeping" yeast. When the yeast is dissolved in a cup of sweetened lukewarm water, it will awaken like seeds from its resting state and begin to multiply. As it multiplies through cell division, it bubbles up into a froth, giving off carbon dioxide. When these bubbles are trapped in bread dough, the dough will rise higher and higher. The starches in bread dough are also food for re-producing yeast; and the yeast, in turn, gives bread it’s special flavor and lightness. Yeast may be tiny, but millions of spores can double the volume of bread dough in just a few hours. Yeast is wild. Catch some in a jar. 1. Mix a cup of flour (whole wheat or white) with a cup of lukewarm water in a quart jar, and stir them together until they are smooth. Place the mixture on a shelf or windowsill and leave it uncovered so the yeast will be able to find food. Now wait and watch it change over the next several days. 2. Stir the mixture each day with a wooden spoon or chopstick. After a few days, it will start to smell a little sour and become sticky. Be a scientist, and take notes about it's smell, taste, feel, and looks. The mixture is fermenting -- another way of saying that it is attracting invisible wild yeast which are feeding off the flour and water and changing everything in the process. Once it begins to ferment, place a cloth napkin or piece of cheesecloth over the jar to keep it from drying out on top. 3. After 5-10 days, depending on the place and temperature of the room, you will notice little bubbles in the mixture. This is carbon dioxide which is a by-product of the reproduction of the yeast. Notice that the smell is more pleasant - almost like peaches. Give it another five days to build strength, stirring it daily and feeding it by adding a few tablespoons of flour and maybe a little water if it is too dry. 4. You now have a cup of sourdough starter that you can add to your bread dough to make it rise. Store it in the refrigerator to keep it fresh and to slow down the fermentation process. After you have added it to the flour and water you will use to make your bread dough, be sure to take a cupful out before adding any other ingredients so it will stay pure and be usable again and again. And remember to stir it and feed it at least once a week with a little flour and water. You can freeze it, too.